Bishamon-do Temple, located on the hillside in the northernmost of the Yamashina Kyoto is one of the Tendai sect of Buddhism. The Temple has a strong connection with the imperial family. The main deity is Bishamonten, one of the Seven Lucky Gods worshipped as the deity of good business and family safety. The temple was established by a monk, Gyoki, in 703 and was rebuilt at the current location in 1665 by Amemasa Tenhami and his disciple Hiromu Oshimi. There is a beautiful garden setting around a small pond with a stone bridge. 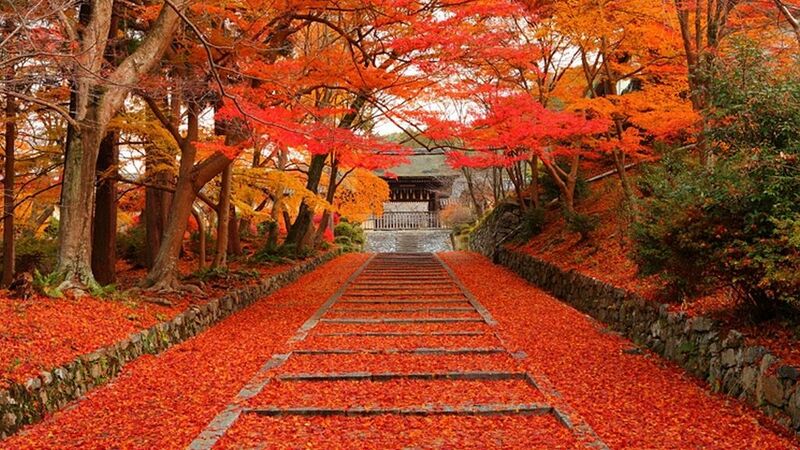 ●A garden is called “bridge to paradise”. Some of the temple buildings and gates were transferred from the imperial palace as an imperial prince assumed the position of head priest in the 17th century. The various buildings in the temple’s grounds are precious remains, many of which are designated as tangible cultural properties of Kyoto city. In the spring, the cherry blossoms are in full bloom, and autumn leaves is very famous, and the temple’s grounds become colorful.